Thog Ross County Cupa an Dùbhlain airson an treas uair an dèidh dhaibh a bhith a' call aig leth-ùine ri na Cuimrich Connah's Quay Nomads. Thàinig 2 thadhal bho Josh Mullin agus 1 bho Jamie Lindsay anns a' chairteal na h-uarach mu dheireadh den gheama an an Inbhir Nis Diathairne. Bha coltas ann fad cuibhreann mòr den gheama gu robh na Cuimrich a' dol a dh' fhaighinn na làmhan aca air a' Chupa airson a' chiad turas. Chaidh iadsan air thoiseach ann an 21 mionaid le tadhal sgoinneil bho Michael Bakare. Bha cothrom an dèidh cothrom aig na Nomads an uairsin ach dh' fhailich orra am ball fhaighinn dhan lìon. San dàrna leth, bha tòrr dhan chluich aig County, ach a dh' aindheoin pailteas oidhirpean, cha b' ann chun an 75mh mionaid a thàinig tadhal bhuadhpa. Bha Josh Mullin air tighinn far na beingidh agus abair gun tug sin atharrachadh air a' gheama. Thàinig tadhal eile bhuaithe an ceann 3 mionaidean. Fhuair Jamie Lindsay and tadhal mu dheireadh do Chounty ann an 86mh mionaid. Bha cothrom aig Michael Gardyne, aig an robh geama math dha-rìreabh, agus aig Kenny van der Weg, ach cha b' urrainn dhaibh am ball fhaighinn dhan lìon. Thuirt manaidsear na nomads, Andy Moireasdan, a rugadh ann an Inbhir Nis agus a chuir seachad pàirt dha bheatha ann an Ceann Loch Biorbhaidh, gu robh e moiteil às na cluicheadairean aige. 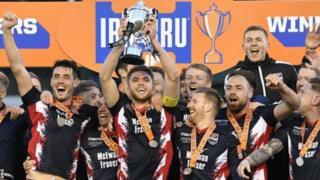 Thuirt cò-mhanaidsear Ross County, Stuart Kettlewell, gun cuidich a bhuaidh sa an sgioba san iomairt aca gus tiotal an Championship a bhuannachadh. Dhùin Dundee United a' bheàrn eadar iad fhèin is County anns an Championship gu 5 puingean agus iad a'buannachadh aig an taigh ri Alloa Disathairne 2-1.